Dynamo Moscow continue their quest for the EuroCup Women title with an emphatic road victory (90-63) against ZKK Hemofarm Vrsac. Belinda Snell (right) hit 5-of-6 from beyond the arc to lead the scoring with 23 points. Dynamo Moscow never trailed in this game. They led (21-11) by the end of the first period and stretched their advantage during the second period (46-32). The game was over as a contest by the end of the third quarter with Dynamo Moscow leading (74-46). For Dynamo Moscow four other players including Anete Jekabsone-Zogota with 17 points finished in double digits. For ZKK Dara Kovacevic led the way with 17 points. For Russian club side Dynamo Kursk made home advantage count as they beat Greek club side Athinaikos BC (77-52). Dynamo Kurst were never in trouble in this game and led (24-11) by the end of the first period to stretch their advantage progressively for the rest of the game. Galatasaray take a 14-point lead into the second leg after defeating Russian club side Chevakata (79-65). Chevakata, playing on their home court, got off to a good start and led (12-4). However Galatasaray did not panic. With Sophia Young, Marina Kress, Seimone Augustus and Isil Alben finding the target they reduced their deficit by the end of the first period. Chevakata went into the second period ahead (14-12), an advantage which they quickly increased by 2 points from Tatiana Bokareva. Galatasaray then stepped on the accelerator and scored 11 quick points to take the lead for good (23-16) after 13 minutes of play. The home side recovered their composure and eventually put a 7-0 run together to reduce their deficit to 3 points with less than 30 seconds before the interval. Korel Engin was to score for the guests which took them into the locker room with a 5-point lead (38-33). The third period was an evenly matched affair with the hosts chasing and the guests countering. Chevakata maintained their advantage (58-51) going into the final period. Chevakata made one last attempt early in the fourth period with Loree Moore (left-yellow) making it a three-point game (55-58). This was as close as it came for the hosts. 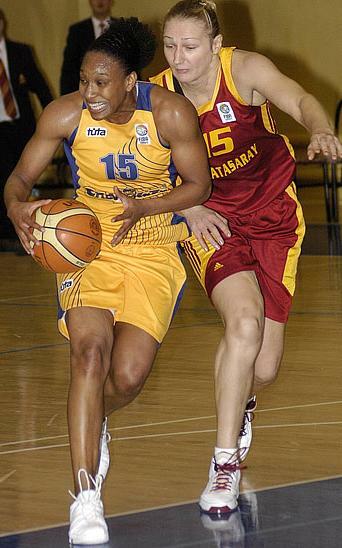 There was nothing Irina Sokolovskaya and Nakia Sanford could do to stop Galatasaray as they went on a 13-2 run including three straight three-pointers to lead (71-57). Galatasary then paced themselves for the rest of the game for victory. Young top scored with 19 points. Kress (left-red) and Augustus also finished in double digits with 18 and 16 points respectively. Turkish international Alben was the player of the match with 12 points and 12 assists. For the hosts Bokareva led the scoring with 21 points. Sanford added 16 points and also had 12 rebounds. Both teams started cautiously during the first five minutes, including a three-pointer for each side (5-5). Then the pace picked up. Cras Basket - playing at home - made the first break to lead (9-5). Yet the guests from San José were soon back on level terms (9-9). San José, led by Cindy Lima and Shona Thorton, scored 6 straight points for them also to open up a 4-point lead (15-11). The pendulum swung in favour of the hosts who scored the last 4 points of the quarter (15-15) to level the score once again. Megan Mahoney (right) then put the home side back into the lead as San José struggled to break the defensive system of the hosts. The pace slowed down and Cras Basket extended their advantage through Australian international Suzy Batkovc to complete an 8-0 run for the hosts (20-15). Lucila Pascua ended the home side's run with almost four minutes played during the second period. The game became littered with turnovers and fouls. All the same Anna Zimerle from Cras Basket was playing well and weaved her way to her sixth assist of the match as Batkovic fired in a trey (24-17). Cras Basket went into the interval leading (27-19). Michelle Greco opened the third period with a trey and her 4th straight point of the match as Cras Basket started with aggression. Both sides still found it difficult to make their shots and the scoring rate did not pick up.Both teams exchanged baskets with the Cras Basket extending their advantage (36-25) after 25 minutes of play. San José finally found a solution to stop Ilisaine David. But then they were hit by Rosi Sanchez as the home side scored 9 unanswered points (43-25). Cras Basket's lead grew (46-27) by the end of the third quarter. Zimerle not only provided assists but also showed her shooting ability from beyond the arc as Cras Basket continued to stretch their advantage (56-33) with 35 minutes played. The guests briefly reduced their deficit to less than 20 points as they attempted to stage a late fight back (38-56). Greco finally put an end to the guests' resistance with back to back baskets. Mahoney finished the scoring for her 18th point of the game with a three-pointer with less than 15 seconds to play. The hosts' joy was slightly spoilt as Pascua scored on the buzzer for San José (66-43). Cras Basket take a 23-point lead into to the second leg. Mahoney finished the game as top scorer with 18 points. Batkovic fired in 13 points and also had 11 rebounds while Greco finished with 10 points. Zimerle finished with 8 points and 8 assists. 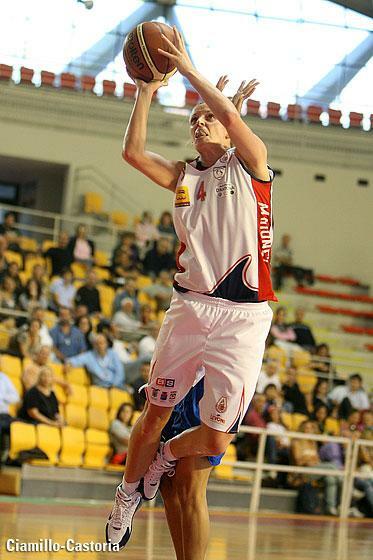 For the French players Elodie Godin scored only 2 points and had 8 rebounds. However she had 4 steals and 3 assists. Audrey Sauret-Gillespie who is finally back after injury played 11 minutes and dished out 2 assists. Murphy led the way for San José with 16 points and Pascua finished with a double-double of 10 points and 10 rebounds.